Now in it's fourth sold out year on Broadway is The Book of Mormon. Yes that's right. It still sells out every night. Pretty impressive don't you think? When the show was first announced I'm sure most people weren't sure what to expect. Oh sure South Park has a huge fan base. Probably why it's still one of the most popular shows on the air after eighteen years with no end in sight. You could say the same thing about The Book of Mormon too. Trust me. It ain't going anywhere anytime soon folks. I mean why should it? The show is hysterical. I thought I laughed a lot when I saw Avenue Q but nothing could have prepared me for the laugh out loud humor of The Book of Mormon. It is a must see. But don't take my word for it. Here is a little synopsis of the show to give you a little more insight on this hilarious show. Enjoy! The Book of Mormon tells the story of two young Mormon missionaries. sent to a remote village in northern Uganda, where a brutal warlord is threatening the local population. Naïve and optimistic, the two missionaries try to share the Book of Mormon, one of their scriptures—which only one of them has read—but have trouble connecting with the locals, who are more worried about war, famine, poverty and AIDS than about religion. Now those are some great reviews. Ready to buy tickets now? Well have I got great news for you. We sell them. As a matter of fact we sell tickets to every show both On and Off-Broadway. Who knew? Just give us a call and one of our friendly ticket experts will take care of the rest. It's that easy. 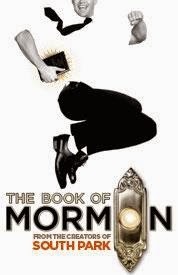 Get your tickets to see The Book of Mormon on Broadway at the Eugene O'Neill Theatre. One more thing. Heading over to London in the near future and want to see The Book of Mormon while you're there? We sell tickets for that one too. So why not give us a try? You'll be glad you did? Until next time theatre fans.